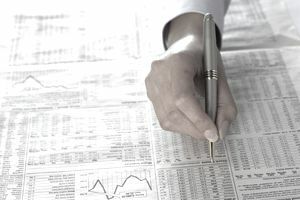 Before getting into stock trading, you need to know how to choose the right stocks, which requires an in-depth understanding of a company’s annual report and financial statements. Learn how to understand what stock really represents in a company, and how to determine the true value of any stock. This allows you to make better-investing decisions by avoiding the costly mistake of purchasing a company's stock when the market has pushed its share price too high relative to its value. Earnings per Share: The total company profit divided by the number of stock shares outstanding. Going Public: Slang for when a company plans to have an IPO of its stock. IPO: Short for Initial Public Offering; when a company sells its shares of stock for the first time. Share: A share, or a single common stock, represents one unit of an investor’s ownership in a share of the profits, losses, and assets of a company. A company creates shares when it carves itself into pieces and sells them to investors in exchange for cash. Ticker Symbol: A short group of letters that represents a particular stock as listed on the stock market. For example, The Coca-Cola Company has a ticker symbol of KO, and Johnson & Johnson has a ticker symbol of JNJ. Underwriter: The financial institution or investment bank that does all of the paperwork and orchestrates a company’s IPO. The workings of the stock market can be a great source of confusion for many people. Some people believe investing is a form of gambling; and feel that if you invest, you will more than likely end up losing your money. These fears can stem from the personal experiences of family members and friends who suffered similar fates or lived through the Great Depression. These feelings are typically not grounded in facts. Someone who believes in this line of thinking likely doesn’t have an in-depth understanding of the stock market and why it exists. Other people believe that they should invest for the long run but don’t know where to begin. Before learning about how the stock market works, they look at investing like some sort of black magic that only a few people know how to use. More often than not, they leave their financial decisions up to professionals and cannot tell you why they own a particular stock or mutual fund. Their investment style can be called blind faith, or perhaps it's limited to a sentiment such as, “This stock is going up...we should buy it." Though it may not seem so on the surface, this group is in far more danger than the first. They tend to invest by following the masses, and then wonder why they only achieve mediocre, or in some cases, devastating, results. Upon learning a few techniques, the average investor can evaluate the balance sheet of a company, and following a few relatively simple calculations, arrive at their own interpretation of the real, or intrinsic value of a company and its stock. This allows an investor to look at a stock and know that it is worth, for instance, $40 per share. This gives each investor the freedom to determine when the market has undervalued security, increasing their long-term returns substantially, or overvalued it, making it a poor investment candidate. When learning how to value a company, it helps to understand the nature of a business and the stock market. Almost every large corporation started out as a small, mom-and-pop operation, and through growth, became financial giants. Consider Walmart, Amazon and McDonald's. Walmart was originally a single-store business in Arkansas. Amazon.com began as an online bookseller in a garage. McDonald's was once a small restaurant of which no one outside of San Bernardino, California had ever heard. How did these small companies grow from tiny, hometown enterprises to three of the largest businesses in the American economy? They raised capital by selling stock in themselves. As a company grows, it continues to face the hurdle of raising enough money to fund ongoing expansion. Owners generally have two options to overcome this. They can either borrow the money from a bank or venture capitalist or sell part of the business to investors and use the money to fund growth. Companies often take out a bank loan, because it's typically easy to acquire, and very useful, up to a point. Banks won't always lend money to companies, and over-eager managers may try to borrow too much, which adds a lot of debt to the company balance sheet and hurts its performance metrics. Factors such as these often provoke smaller, growing businesses to issue stock. In exchange for giving up a tiny fraction of ownership control, they receive cash to expand the business. In addition to money that doesn’t have to be paid back, going public, as it's called when a company sells stock in itself for the first time, gives the business managers and owners a new tool. Instead of paying cash for certain transactions such as an acquisition of another company or business line, they can use their own stock. To better understand how issuing stock works, take the fictional company “ABC Furniture, Inc.“ After getting married, a young couple decided to start a business. This allows them to work for themselves, as well as arrange their working hours around their family. Both husband and wife have always had a strong interest in furniture, so they decide to open a store in their hometown. After borrowing money from the bank, they name their company “ABC Furniture” and go into business. During the first few years, the company makes little profit because they invest the earnings back into the store, buying additional inventory, remodeling, and expanding the building to accommodate the increasing level of merchandise. Ten years later, the business has grown rapidly. The couple has managed to pay off the company’s debt, and have profits of more than $500,000 per year. Convinced that ABC Furniture could do as well in several larger neighboring cities, the couple decides they want to open two new branches. They research their options and find out that they need over $4 million to expand. Not wanting to borrow money and have to make debt and interest payments again, they decide to raise money by offering equity to potential shareholders, so they sell stock in their company. The company approaches an underwriter for the stock offering, such as Goldman Sachs or JP Morgan, who digs into their financial statements and determines the value of the business. As mentioned before, ABC Furniture earns $500,000 after-tax profit each year. It also has a book value of $3 million, which means the value of the land, building, inventory, and other assets, after covering the company’s debt. The underwriter researches and discovers the average furniture stock trades on the market at 20 times its company's earnings. What does this mean? Simply stated, you would multiply the company's earnings of $500,000 by 20. In ABC’s case, this results in a market value estimation of $10 million. If you add in the company's book value, and you arrive at $13 million. This means, in the underwriter’s opinion, that ABC Furniture has a total value of $13 million. The young couple, now in their 30’s, must decide how much of the company they are willing to sell. Right now, they own 100 percent of the business. The more company shares they sell, the more cash they’ll raise, but they must keep in mind that by selling more, they’ll be giving up a larger part of their ownership. As the company grows, that ownership will be worth more, so a wise entrepreneur would not sell more than he or she had to. After discussing it, the couple decides to keep 60 percent of the company and sell the other 40 percent to the public as stock. When you do the math, this means that they will keep $7.8 million worth of the business, and because they own a majority of the stock, greater than 50 percent, they will still be in control of the store. The other 40 percent of the stock that they sold to the public has a value of $5.2 million. The underwriter finds investors who want to buy the stock and gives a check for $5.2 million to the couple. Although they own less of the company, the owners' stake will hopefully grow faster now that they have the means to expand rapidly. Using the money from their public offering, ABC Furniture successfully opens the two new stores and has $1.2 million in cash left over, since they raised $5.2 million but only used $4 million. Their business performs even better in the new branches. The two new stores make around $800,000 a year in profit each, while the old store still makes the same $500,000. Between the three stores, ABC now makes an annual profit of $2.1 million. Although they don’t have the flexibility of a small business or the freedom to simply close shop anymore, their company is now valued at $51 million. You would reach this by multiplying their new earnings of $2.1 million per year by 20 (the average furniture stock multiple mentioned earlier) and add the company's latest book value of $9 million since each store has a book value of $3 million. The couple’s 60 percent stake now has a total worth of $30.6 million. With this example, it’s easy to see how small businesses seem to explode in value when they go public. The original owners of the company, in a sense, become wealthier overnight. Before, the amount they could take out of the business was limited to the profit that was generated. Now, the owners can sell their shares in the company at any time, raising cash quickly. This process forms the basis of Wall Street. The stock market functions as a large auction where ownership in companies just like ABC Furniture are sold to the highest bidder each day. Because of human nature and the emotions of fear and greed, a company can sell for far more or for far less than its intrinsic value. A good investor learns to identify those companies currently selling below their true worth so that they can buy as many shares as possible.